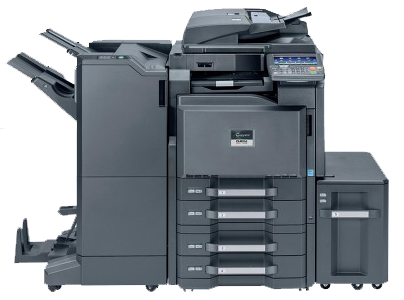 The versatile Ricoh Aficio MP 3352 is a black and white laser multi functional copier with the options of adding copying, scanning and fax capabilities. The MP 3352 distributes prints in as little as 4.5 seconds at 33 pages-per-minute. Ricoh claims the MP 3352 has the smallest footprint of any A3 MFP (in its range). With a smaller-than-ever footprint, the MP 3352 easily integrates into compact office environments. The MP 3352 optional internal finishing is capable of auto duplexing, collating and stapling sets. Paper sizes up to 11″ x 17″ are easily accommodated in both of the standard paper drawers. The 100-sheet bypass tray will process envelopes, label, and heavier paper stock. The MP 3352 paper handling can be customized to a business’s specific needs. The Ricoh AFICIO MP 3352 can generate up to 100,000 impressions per month. The MP 3352 black toner (Ricoh 841337) yield is estimated at 11,000 pages with 5 percent page coverage.